!! OMG, I am Spartacus (with cats) !! covered up. But what if the peens are obscured with… kitties? 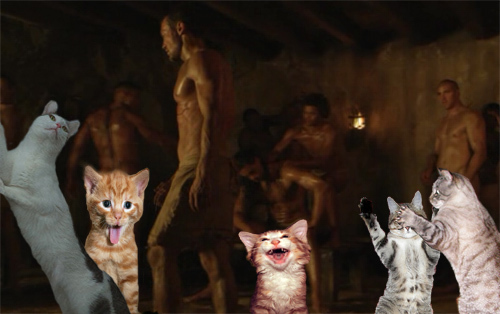 An intrepid reporter from The Houston Chronicle has taken it upon himself to photoshop a bunch of mewling cats into racy screengrabs from Starz’ Spartacus: Blood and Sand, and the results are LOL– and maybe still hot or am I crazy? More of my favorites are after the jump. Thanks to Squids Need Love for the tip. See more over at The Houston Chronicle! 2 Comments on "OMG, I am Spartacus (with cats)"
“What the Hell?” Why is Hollywood so damn Homophobic when it comes to ancient portrayals of Greek and Roman history? There were no women in the underground houses of these fighting warriors. All of the oiling up and preparations done on the men were done by other men. However, as it goes with Hollywood,… all women have to be whores to appear on film. This post was absurd and a waste of my time!! Cats for real, WTF?? ?